This week we are taking a brief pause in our travels to report on a spectacular discovery from the Delaware River. On November 10, 2012—235 years to the date of the British bombardment of Fort Mifflin, members of the Anchor Yacht Club, Bristol, Bucks County, recovered a cheval-de-frise. Cheval-de-frise is the singular term, (plural is chevaux-de-frise) for a defense mechanism which originated in eastern Holland and western Germany as a land obstruction. Modified and adapted for use in water, these were employed during the American Revolution as an obstruction against the British Naval fleet. Placement of these devices in the Delaware River began in October of 1775 under orders from the Committee of Safety which was formed by the General Assembly in June 1775 under pressure from prominent Patriots. One of the leaders in this movement was Benjamin Franklin, who was appointed as president of the Committee also referred to as the Council of Safety. After their September 11, 1777, victory at the Battle of Brandywine, British General Sir William Howe and his troops captured and occupied Philadelphia. General Howe had a supply problem. He was surrounded by George Washington’s Continental Army and more importantly the Royal British Navy could not bring supplies into the city because the Americans had two forts protecting the Delaware River. 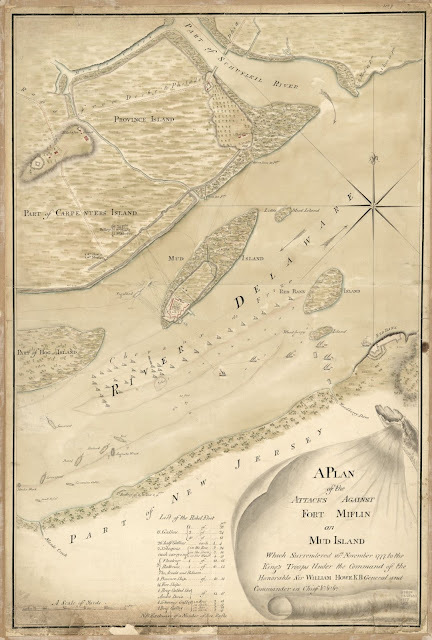 Fort Mercer was located on the New Jersey side and Fort Mifflin was situated near the mouth of the Schuylkill River. As part of the defenses of these forts chevaux de frise were placed in the Delaware River to prevent British ships from supplying Howe’s army. The objective was to place these below the surface of the water so as to be undetected by British ships and the iron point would puncture the hull of vessels attempting to move up the Delaware. A large number of chevaux-de-frise were placed around Fort Mifflin to hinder attacks by the British. However, after six weeks of careful maneuvering, the British Navy was able to bring hundreds of cannon to bear on the fort. Beginning on November 10th, 1777, the British began one of the largest bombardments of the war. The defenders put up a heroic struggle, giving time for Washington and his army to escape to Valley Forge, but after five days, Fort Mifflin was abandoned and the fighting around Philadelphia was over for the winter. While pulling up moorings last November, during cleanup from Hurricane Sandy, members of the Anchor Yacht Club encountered what was initially thought to be a log. Measuring just under twenty-nine feet in length with a diameter of thirteen inches at its base, this was not an ordinary log. Tangled up in a mooring chain (probably during the storm) in about 28 feet of water and about 150 feet from the shore, the cheval-de-frise had survived for 236 years in the Delaware River. The artifact was water logged and didn’t float so it was probably rolling along the river bottom during the storm when it became entangled in the chain. Closer examination revealed a large iron spike at one end at which point they contacted the local historical society for assistance. Much of the credit for the preservation of this important piece of American history can be attributed to Mr. Gary Winchester a member of the yacht club. Mr. Winchester made numerous phone calls seeking advice and guidance on preserving what he had clearly recognized as an important piece of history. Gary was directed to contact the Pennsylvania Historical & Museum Commission (PHMC) who is the responsible agency for all archaeological discoveries within waters of the Commonwealth. This is where our role in the preservation of the cheval de-frise begins. The PHMC removed the cheval-de-frise this winter to one of our nearby historic sites, Pennsbury Manor, to prevent damage from ice during the winter months and in anticipation of its future conservation treatment. It was wrapped in protective coverings and watered to prevent the wood from drying out and damaging the artifact prior to treatment. Several treatment options were considered prior to selecting the most cost effective option that would insure its preservation. In preparation for transport of the cheval-de-frise to a conservation lab, completion of a condition report was necessary to document any changes which have occurred since its arrival at Pennsbury Manor. Measurements, photographs and notes were made to carefully assess any changes in condition or any additional observations. During this process we discovered an additional nail hole on the spiked end where the fourth iron strap would have attached to the log, but this strap was missing when the cheval-de-frise was recovered. On the opposite end, about six feet from the base, we discovered an iron hook or curved spike which we had not observed previously. At almost the same position (8’ from iron point) at the spiked end is a nail formerly observed and of similar size to the one previously referenced. One additional nail/bolt was observed about eight feet from the base. References to securing the cheval-de-frise in their wooden box may explain the positioning and use of these metal fragments. Research and comparison of these spikes to other known examples will aide in our understanding of construction methods for the chevaux-de-frise. We are delighted to report that on Monday, June 17th the cheval-de-frise was safely loaded on an air-conditioned moving van for its trip to Greenville, North Carolina. It is now in the capable hands of the staff at East Carolina University’s Maritime Conservation Lab. The conservation process will take about a year to complete and will involve the use of a polyethylene glycol (PEG) treatment. This method of treatment essentially exchanges out the water and replaces it with PEG over a gradual process of increasing levels of PEG until the desired level of absorption is obtained. This treatment process has been used in waterlogged wood conservation for several decades with positive results and is considered a standard treatment method. Research of the chevaux-de-frise has just begun as this particular example presents some unique questions. It was found almost 30 miles north of Fort Mifflin. No historical reference has been located indicating the placement of this cheval-de-frise anywhere close to Bristol. Previously recovered examples from the Delaware River have been incomplete. The Independence Seaport Museum in Philadelphia is currently curating an example which is just over eleven feet long; its base is broken so that its full length can’t be determined. Examination of historic documents and comparison with other cheval-de-frise will continue while the cheval undergoes conservation treatment in preparation for a future exhibit venue, hopefully in the Philadelphia area. This reference by John W. Jackson provides the most complete information located to date for the method of construction of chevaux-de-frise. Large frames or bin-like containers approximately 30 feet square were constructed from large timbers. Wide pine plank formed the floor of these bins and the sides were constructed of logs and lined with pine plank. Quarries on the upper Schuylkill River provided stone used for anchoring these boxes in the Delaware River. Long posts, mounted with large iron spears which faced downstream were designed to rip out the bottom of enemy ships. The boxes were floated into position with heavy anchors and the still empty box was lowered into the river bed and secured in place with the stone ballast. Some accounts report the use of 15 to 20 tons of stone for securing frames which were then chained together to prevent being easily canted to discharge their ballast or towed away by the British. The chevaux-de-frise on the Delaware River were typically two to three posts and their placement differed based on depth of the river. Jackson states that most of the accounts for construction of these lines of defense are based on those built for the Hudson River and are much larger than those recovered in the Delaware River. In 1784 sixty-three chevaux-de-frise were removed from the Delaware River and were recovered at depths from four to ten feet below the water line. The frame bottoms were recovered in mid-channel from depths of thirty to forty-six feet at low tide near Billingsport and twenty-two to thirty-three closer to Fort Mifflin. This artifact serves as tangible evidence of our attempts to secure the Delaware River, and prevent the passage of ships by the British Navy during the American Revolution. Thanks to the efforts of many people and organizations, this piece will survive for the enjoyment of future generations. Acknowledgements - Crozier Fine Arts; Justin Grant, Michael Tweedie, and Dan Burns. Pennsbury Manor; Doug Miller, Todd Galle and volunteer Jim McCullen. Gary Winchester and the Anchor Yacht Club, Bristol PA.
Made me think of the barriers in the water off Normandy. Neat stuff, thanks. East Carolina University did or is still doing "restoration" of the tree pole (a cheval de frise) recovered from Delaware River. The restorers at ECU wondered if the tree trunk was that of an American chestnut. Folks from The American Chestnut Foundation suggested how to analyze the wood to determine the species. Anyone know the answer? East Carolina University has completed the conservation treatment of the Cheval de fries and the artifact has returned to Pennsylvania. The treatment/analysis included SEM(scanning electron microscope) images which indicates oak as the species due to the presence of tyloses in the wood fibers. We are in early planning stages for a future installation of the cheval de frise at Washington Crossing Historic Park . Thank you for your inquiry. It's now 2018, is this item on display now at the Washington Crossing Historic Park? Yes, we are happy to report that the cheval de frise is on display at Brandywine Battlefield Park. Additional text and graphics for interpretation will be added this spring. This update can be found in Pennsylvania Heritage magazine, winter 2018, pg.42. Thank you for your interest in this significant artifact of the Revolutionary War in Pennsylvania.